These American-style pancakes are sweet and indulgent, yet surprisingly light. What’s more, you’ll be amazed at how quick and easy they are to make! I like to add blueberries for a treat, but they’re just as yummy and even easier to make without. I expect you could add chocolate chips with equal success. 2. Mix dry ingredients – flour, sugar, baking powder and salt – in a bowl. 3. Melt butter (30 seconds in the microwave) and mix it with the egg and a splash of the milk. 4. Combine wet and dry ingredients, stirring with a wooden spoon until there are no lumps. 5. You’ll have a really thick mixture. Gradually stir in more of the milk, getting rid of any lumps as soon as they appear, until it’s fluid, yet still thick. 6. If using, mix in the blueberries. 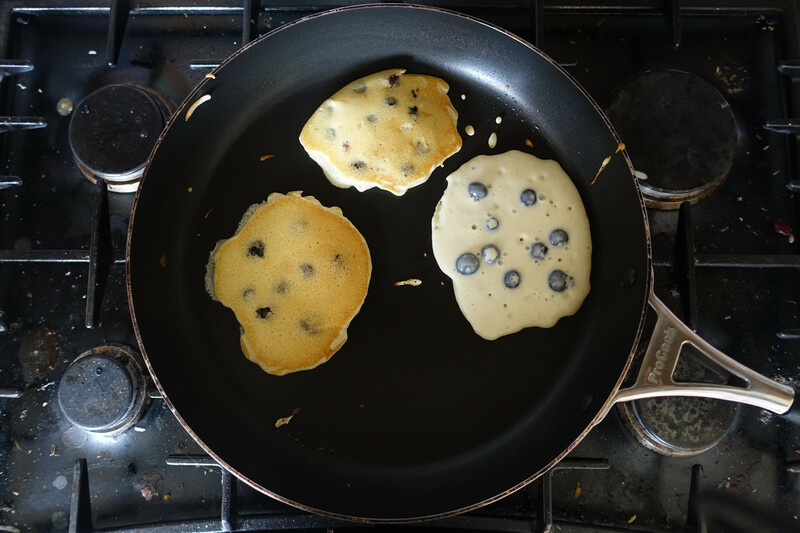 They generally don’t pour out evenly, so you might want to rearrange them with your fingers once the pancakes are in the pan! 7. Heat a non-stick frying pan on the hob until it’s really hot, then pour out enough of the mixture to make a small pancake. If you have a big pan, you’ll be able to do a few at a time on different parts of the pan. 8. Flip them over when the bubbles that form on the surface have popped and the mixture is almost set. They’ll still be a bit runny so be quick! 9. 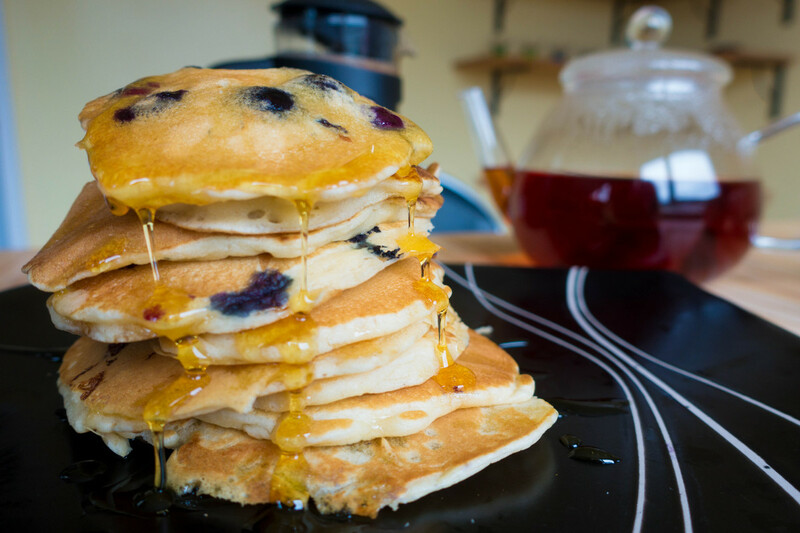 If using blueberries, press down the pancakes a bit to squash the berries slightly. 10. They’ll need less than a minute on the second side. When golden underneath, transfer them to the plate in the oven to stay warm until all the mixture has been used. Recipe and photos (c) Juliet Langton, 2015. All rights reserved. 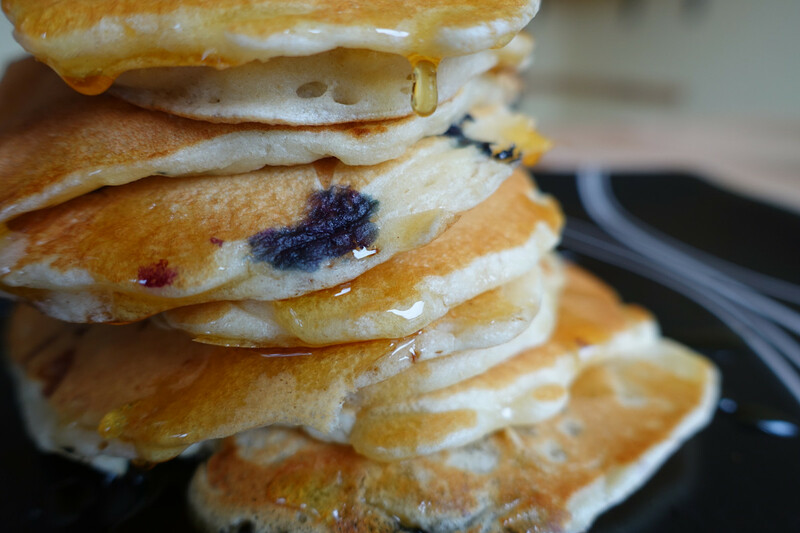 Posted in Food, PhotographyTagged American pancakes, blueberries, blueberry pancakes, breakfast, brunch, dessert, Featured, golden syrup, RecipeBookmark the permalink.